Tess Goodwin's life in rural Iowa is sheltered and uncomplicated. Although she chooses to spend most of her free time playing chess with her best friend Zander, the farm-boy from next door, her skills as a bovine midwife and tractor mechanic ensure that she fits in with the other kids at East Chester High. But when her veteran father reenlists in the Army, moving her family halfway across the country to North Carolina, Tess is forced out of her comfort zone into a world she knows nothing about. Tess approaches the move as she would a new game of chess, plotting her course through the unfamiliar reality of her new life. While heeding Zander's long-distance advice for making new friends and strategizing a means to endure her dad's imminent deployment to the Middle East, she quickly discovers how ill-equipped she is to navigate the societal challenges she encounters and becomes convinced she'll never fit in with the students at her new school. When Leonetta Jackson is assigned as her mentor, she becomes Tess's unexpected guide through the winding labyrinth of cultural disparities between them, sparking a tentative friendship and challenging Tess to confront her reluctant nature. As the pieces move across the board of her upended life, will Tess find the acceptance she so desperately desires? 'The Next to Last Mistake' by Amalie Jahn will have readers considering their own lives through a bittersweet lens as they work through feelings of security, happiness, separation, loss, and inequality, among others. Jahn has written a story that will resonate with readers of all ages, as main character Tess navigates the difficult task of uprooting her life due to her father's reenlistment in the military. 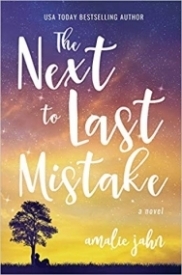 While struggling to find a way to come to terms with her eventual separation from being a farm girl in Iowa and sharing her days with best friend Zander, she also wonders about the new life she doesn't know how she will acclimate to in Fayetteville, North Carolina. However, she finds strength she never knew she had, all while learning more about herself than she had even thought possible. Tess finds that life sometimes turns out in unexpected ways as she makes the acquaintance of new friends at her new school, including Leonetta, the girl with whom she is partnered to help show her the ropes of her new school. She also finds herself facing off once again with the school mean girl, noting that certain types of people and cliques are ever present no matter where one goes in the world. Dealing with life and all of its intricacies through her love of chess, she finds metaphorical connections that shape her into a more well-rounded person. Learning to cope with her father's day-to-day military jargon and life, along with the racial biases that she has never had to even think about due to the mostly homogeneous life she led in Iowa, forces her outside of her comfort zone at times. This is not only good for her, but inherently useful for readers, as it will make anyone think about these aspects of life long past reading the last page of the story. Readers who love feeling right in the thick of it all, as though they can picture the setting and be dropped right into it, will love Jahn's writing. Whether smiling, gasping, tearing up, or feeling a smattering of all of these emotions, there is something that will make every reader stop and think about how to consider their own lives through Jahn's vivid words.